Last week, I finished a six-week course of study at Mayanot, an orthodox Jewish yeshiva in Jerusalem. It was the deepest I had ever delved into the world of religion, having grown up and been educated in a pretty secular world, and was at the same time maddeningly frustrating and surprisingly enlightening. In this post, I’m going to retrace my process of grappling with religious thinking, from mixed initial reactions to mixed final understanding. I enrolled in yeshiva initially as a reaction to a number of experiences I had in college. My knowledge of Judaism had been fairly limited at that point and my relationship to the jewish world had been distant. In college, I started drifting in more jewish circles and finding myself drawn to jewish people. As I started to move in this world, I discovered that my limited jewish experience was a handicap, as I was unable to fully participate in the more weighty and intimate aspects of this jewish world. It led to feels of marginalization and exclusion which would linger with me for a while. The yeshiva represented, to me, a chance to redeem myself and to flesh out my understanding of that world. I also joined out of a sense of curiosity. Having attended a very liberal university, and moved in very liberal circles within that very liberal university, I had become quite comfortable with the new-age spiritual stance that was so prevalent at the time, a sort of zeitgeist concentrate. This outlook included a rejection of western religion and a fetishization of eastern religion, combined with a sort of “distancing” from scientific thought in a way that both acknowledged its validity while simultaneously ignoring its principles when inconvenient in pursuit of the ultimate goal, which is a consistent feeling of contentedness. After living for several years in this spiritual neighborhood, I started becoming a little bit uncomfortable. It seemed strange to me that the western religious traditions were so severely dismissed by the new-agers. Implicit always was the idea that these western traditions rested on an unstable intellectual foundation (generally, belief in a supreme deity and appealed to those of questionable intellect, most of whom were indoctrinated into the tradition as children and were repressed, never given the freedom to explore themselves and their spirituality in the way that the new-agers did. Although I could see where the new-agers were coming from, it didn’t add up. These western religious traditions (I’ll shift now to Judaism in particular) are the culmination of thousands (thousands!) of years of thought. If we accept that Jewish religious scholarship has generally been an occupation of no small prestige, we can infer that individuals of very high intelligence have been involved in the development of this tradition. Furthermore, this tradition have been shaped by the forces of history in a way that few others have, and have persisted and adapted through an amazing variety of circumstances. Certainly, there must be something there, some profound insights into the nature of the human experience. Finally, as a Jewish person, I felt like I had an obligation to at least know what was going on in the world of Judaism. Running after eastern and new-age philosophies began to feel very shallow, as I had no idea what was going on in my own tradition. Accept or reject it, I felt like I should at least understand it. I try to avoid dilettantism whenever possible. The rest of this post will be much elucidated by a basic understanding of the structure and history of the Jewish religion. Please entertain my humble effort, and know that dates are approximate. ~1400 BCE: Moses receives/”receives” the Torah at Mt. Sinai, shortly after freeing the Jews from Egypt following a series of excellent special effects. This Torah consists of two components: the “written law” and the “oral law.” The written law consisted of the five books of Moses and the Ten Commandments, representing the foundation of jewish religion and law. The oral law consisted of the proper interpretation of the written law. This wasn’t written down, and needed to be passed from teacher to disciple directly. This will be important. ~1000 – 600 BCE: The Jews are united in a kingdom (Saul, David, Solomon, et al) and Judaism enjoys a golden age, with the new center being the dazzling Holy Temple in Jerusalem. Traditions are kept by the high priests, who pass information from teacher to student. Prophets still active. ~586 BCE: Babylonians destroy the temple, send Jews into exile. ~586 – 538 BCE: Jews in exile in Babylon, forced to think about how to preserve the religion in an unstable world. ~538 BCE – 70 CE: Jews return to Israel, rebuild temple, attempt to restore glory of the first temple golden age. It is recognized that the “age of the prophets” is ending and that individuals are no longer being recognized as having legitimate powers of prophecy. At some time during this period (historians debate), the jewish leadership created a body known as the “Great Assembly,” consisting of 120 religious leaders, to exercise some guidance on the direction of Judaism following the destabilizing events of the past several centuries and ensure that the tradition did not become corrupted in the future. One of their major actions was to codify the written law, incorporating two additional volumes: “Prophets” (writings of the various prophets), and “Writings” (a collection of writings on various topics). They then sealed these books and prohibited further editing. The continue to struggle under the yoke of various empires (Persian, Ptolemaic, Seleucid) before enjoying a brief period of independence (Hasmonean dynasty) and eventually being crushed by the Romans in 70 CE. ~200 – 500 CE: Following the creation of the Mishnah, there began a long period of discussion, spanning the entire Jewish world, of the meaning and interpretation of the laws contained in the Mishnah. Those of you paying attention will doubtlessly take note and be amused at the observation that once the oral law became a written law, a new oral law spontaneously emerged in order to interpret it. The sociobiologists among you might be brave enough to venture a natural law regarding human societies to try to explain this. Another time, perhaps. These discussions are themselves codified into a companion work to the Mishnah called the “Gemara.” The Gemara and the Mishnah together become known as the “Talmud,” which would go on to become the centerpiece of Jewish religious scholarship for centuries to come. ~500 – Present: Religious scholarship continues, with “generations” of scholars coming along to build on and expand the work of previous generations, eventually taking us to the present day. These works include the commentaries of Rashi, the analyses of Maimonides, and the major codification of Jewish law by Caro. The key thing to understand about this period (and in fact, the periods before) is that a major pillar of Judaism is the sort of general understanding that Jews are inevitably drifting away from truth, rather than towards it. The importance of this cannot be overstated. Judaism considers the religion handed at Sinai to have been utterly divine, and Jews since then have been slowly forgetting or distorting that initially perfect faith. Much of Judaism in the last 3400 years has been various efforts to retain and preserve this initial knowledge, and to insulate it from corruption or distortion. One of the major ways in which this is accomplished is the “hierarchization” of opinions, with older opinions being held with more legitimacy than newer opinions. This means that the opinions of a scholar active in 400 BCE overrules the opinions of a scholar active in 200 BCE, and a scholar in 100 CE overrules a scholar active in 400 CE. This continues over time, with scholars of the 12th century being unable to challenge scholars of the 8th, but being able to dictate the truth to scholars in the 16th. The rationale for this is, as before, the fear of the corruption of the religion. Given the linear timeline of Judaism, the closer a scholar is to the “source” (Mt. Sinai), the more accurate their opinion is. The implications for this are several and they are fascinating. The first is that the rear-facing direction of the religion prevents it from “learning” and incorporating new understanding of the world into its framework (although as I will suggest later, it does so anyway). The second is that Jewish religious scholarship is overwhelmingly focused on getting the student to understand what the authority is saying, rather than to generate their own original conclusions. The third is that the religions is remarkably well-preserved. There is amazing continuity of writings and practices across thousands of years and thousands of miles, which would be unlikely in absence of such an obsession with collective memory. All of these points deserve significantly more investigation than I am able to offer at the moment, so bookmark them for now. I began my studies with what was, I thought, a very open and accepting stance. I tried to refrain from any premature criticism and prepared myself mentally to embrace new ideas. I refused to accept the divinity of the Torah or the idea of a divine revelation as Mt. Sinai, ideas which I could not accept without completely discarding both my secular education and accumulated life experiences, which I saw no reason to do. Other than that, though, I was open to any idea (my intention was to learn the “religious” ideas of Judaism and then refashion them into secular philosophy as I saw fit). I had, to say the least, a rough start. It was an exhilarating roughness, however, as it helped me realize how much I had underestimated the shift I would need to make to succeed in religious study, and how large a shift I was in an environment to make (as a brief aside, there are few things I love more than tectonic shifts in thought). The roughness came not from my attitude towards the material I was about to learn, but the disconnect between the way I had been taught to learn and the way I would need to learn. It was a disconnect in the way I had come to understand information, and legitimate methods for acquiring and understanding it. My entire epistemological foundation would need to be re-poured. Exciting stuff. My frustration was first felt in Gemara class, when the professor would outright dismiss my questions. I found this deeply problematic. I was coming from a secular university environment, where I had been trained to gather and organize information through listening and questioning. I had learned to explore the internal workings of one or another structures of thought (micro-economics, for example, or neurobiology, or linguistics) and to judge how well it aligned with my understanding–based on personal experience and empirical evidence–of the world. I learned by asking and probing, and then applying my understanding to a set of problems, and revising my understanding based on how well my previous understanding helped me to successfully handle those problems. The material was treated as a lens for sharpening our understanding of the world. It was iterative and critical, and nothing was off-limits. We had been discussing the notion of falsifiability, a hugely important but often overlooked principle of science, which states that for a theory to be scientifically valid, there has to be some way of proving it wrong. I could hypothesize that, at this exact moment, the entire world is being sustained by invisible elves, who give all matter its color and shape. There would be no way for you, my colleague, to create an experiment to prove me wrong, because I could always say that the elves are responsible for your experiment’s results. My hypothesis is unfalsifiable, and therefore invalid. A scientist would be justified in rejecting my hypothesis outright. But at yeshiva, we aren’t being scientists. We were–at least I was–entertaining the idea that there are things beyond science that are nonetheless worth knowing. And while in the scientific world the answer to the question “can you reject an unfalsifiable hypothesis on principle?” is overwhelmingly yes, in the domain of spirit the answer was more uncertain. I could easily reject the entire Talmud project as being unfalsifiable, but what would I have won? They aren’t playing by those rules. I wouldn’t achieve anything by rejecting something on my grounds. I would feel better about myself, certainly, but I would become insubstantial, a non-person in the world of Judaism. I had gone to yeshiva to learn something, not to be right. I decided to stick it out. 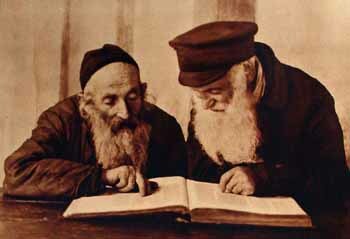 To study Gemara/Talmud, students first work with a partner (called a chavruta, or “friend”) to translate the text and try to understand the meaning. Afterwards, they meet with a rabbi, who explains the meaning and helps students understand where they went wrong in their analysis. The text takes the form of debates around the text of the Mishnah, with the ancient rabbis analyzing the laws and trying to understand how and when they should be applied. Much of the trick of Talmud study (at least at my neophyte level) seemed to be properly translating the sentences (most of which were written, of all things, in aramaic) and then correctly extracting from one or two sentences the example scenario that the rabbi is using to make his point. An example might include a law about when you are allowed to keep some object you find in a hole in a wall (remember, these were written nearly 2000 years ago), with a rabbi discussing a special case when the object is a commodity (like a pile of rice) vs a discrete object (like an apple). Your job as a student is to figure out why the rabbi introduced this special case (since we assume everything must be there for a reason) and what the implications are for the Halacha (Jewish law). In this case, the rabbi is pointing out that since commodities can spill, thereby distorting where they were initially left, you should split it between parties on both sides of the wall (whereas a single object would belong to either the person on the near or far side of the wall, depending on which side it was closer to). Another rabbi might introduce another idea, and then you’ll need to figure out what and how it fits into the preceding discussion. There isn’t much room for your original thinking–your opinions on what should happen if someone finds an apple in a wall are 100% irrelevant. Your creativity is limited to interpreting the text, and the answer is whatever the highest convenient authority (be it your teacher, the head of the yeshiva, or a relatively lucid 16th century commentary) says it is. At first, whenever I would translate a new sentence and start trying to extract meaning from it, I would spend two or three minutes mulling it over before either deciding what it meant (if it made sense to me), or dismissing it as classical-era babble (if it didn’t). I would then go to class and learn the “correct” interpretation, which tended to be something interesting and/or clever, if seemingly impractical and/or limited. I would ask a few “what-if” questions which would eventually lead the rabbi to threaten to throw me out of class. Then the process would repeat. After a few weeks of this, however, I started to notice a change. Now, when I translated a new sentence, I would begin analyzing knowing that there was some meaning that would eventually be revealed. It became a question of “what does this mean,” instead of “what does this mean to me.” I would spend more time puzzling over each sentence, and became more creative in my ability to find meaning inside of opaque language. Eventually I would end up consistently being pretty close to what the “correct” meaning turned out to be. I started thinking of this (somewhat tongue-in-cheek) as the “great inversion” of secular and religious thought. In the secular world, meaning is held (at least these days) to be mostly subjective, with empirical evidence being the final arbiter of most questions. This makes it hard to peer deeply into things, as they are held to be “meaningless” outside of your interpretation of them. If something doesn’t make sense, you’re able to discard it as being meaningless before moving on to something else. In other words, we cast out into the world for experiences, and then decide ourselves what’s true and what’s not. The “great inversion” flips this backwards, with the text becoming the source of truth, and your job becomes that of extracting the meaning buried in the text, rather than casting out for personal experiences to enable you to construct meaning for yourself. Or, in more fanciful language, the secular mind casts a net out into the world and then decorates itself with the contents of its catch, while the religious mind wallpapers itself with the one true text. The world becomes a function of the text, rather than the text being a function of the world. There are a few implications of this inversion which I think bear some valuable lessons for the secular world. The first concerns humility. Jewish scholarship is heavily centered around understanding the thinking of people you consider smarter than yourself. The authors of the books we study represent (at least in our imagination) near-mythic levels of intelligence and spiritual strength. It is repeatedly made clear that we are incapable of understanding the religion in its entirety, but we nonetheless must make our best effort (and in some cases devote our lives) to understanding it as well as we can. Such scholarship leaves little room for arrogance, and although it is inevitable that particularly bright scholars might become arrogant in their abilities on a small-scale, the overall structure of study seems slanted towards humility. There is something comforting about this–a difficult problem is never truly intractable, and the answer is always there… if you are smart enough to find it. Contrast this with the sense of hopelessness many people in the secular world feel when confronted with the worlds more vexing questions. The second concerns the post-modern aspects of our culture, and might be my personal biggest take-away from this entire experience. After a few weeks of getting comfortable with the religious mentality, I found that I was able to look back on the secular mentality and understand it from a religious perspective. It was a bizarre sensation at first, as I felt myself filling up with pity for the “misguided seculars” with their “materialism” (both cultural and metaphysical) and their lack of faith. As I said, it was a bizarre sensation. I was able to look back on the secular world from a distance, and saw something interesting. In secular scholarship (at least in my experience–I’m not a graduate student, and I worked mostly in the social sciences, though I did spend a decent bit of time both in the hard and natural sciences and the humanities), the emphasis is placed on what the student can extract from a particular source. This is the post-modern idea, where things have no meaning intrinsically, and only acquire meaning upon interpretation. Students generally do try to study and learn what’s going on, but in the end, it is their interpretation and understanding that matters–the text is only a tool. What I realized is that, given the liberty to interpret their sources, students are simply projecting themselves onto the sources, and then calling that interpretation. In the absence of a fixed “meaning” to discover, students are able to discover whatever meaning they wish–in theory. In practice, students project themselves (their experiences, beliefs, emotions) onto the source, which they then analyze and think they have learned something. In a sense, students aren’t learning the source, they are using the source as a distorted mirror to reflect themselves back at themselves–and herein lies the post-modern rub. There seemed to be something very narcissistic about this, with the sources being open to question and the student being given permission to think whatever they like. All this raised an interesting question: is one mode of thinking “better” than the other? To my mind, the religious mode of thinking contains an enormous, inescapable, ultimately fatal problem: the “infallible” source. For all the positives that come from such a mindset, the requirement of accepting a source as being beyond question seems unacceptably risky. This becomes doubly true when you realize that while religion is on one hand a set of ideas, it is also a set of institutions which, despite what we might tell our children, are as open to corruption and exploitation as any other. Even if the source it all that it is claimed to be (which I personally can’t accept), the odds that the text has never been co-opted or exploited by religious leaders are simply too long. Remember, the Enlightenment didn’t happen by accident. That said, the secular mode has its own several problems. There are ample gaps where narcissism can masquerade as judgment, and the absence of a fixed frame of reference leaves open the possibility that the line of thinking will take a disastrous or destructive turn (fascism would be an extreme but appropriate example). Furthermore, the absence of authority means that secular scholars are restricted by their own understanding. Secular scholarship all but rests on the assumption that we can know better that those who came before us. I think this is a great assumption in general, but it’s important to realize that brilliant people have been alive before us. Odds are good that the things that survived all the way to us survived because they were written by brilliant people. Probably most of them were smarter than we are. Not smarter than modern society as a collective, of course, but as far as individual people, it’s certainly possible. Who knows how much of our collected intellectual heritage is lost because people no longer feel the need to try to understand it. One last point before moving on: I have a sneaking suspicion that religious scholarship makes people smarter (at least in regards to analytic ability) in a way that secular scholarship doesn’t. I think it has to do with the kind of mental process required. If you’re willing to go along with me and define learning as “acquiring new patterns of thinking,” realize that religious scholarship forces people to slave over a text until they are able to duplicate the thought process of the author–in this case, duplicate the collective thought process of hundreds of years and thousands of lifetimes of scholars. They’re forced to stretch their mind into very advanced shapes to grasp the material. Contrast this with secular “interpretive” scholarship, where scholars are able to sprinkle their existing patterns of thinking onto whatever they are meant to analyze, ultimately discovering little more than what they already knew. I’m being overly harsh on secular scholarship, I realize, and I know that people (myself included) learn tremendous amounts this way. I should also disclaim and say that this aspect of secular scholarship likely diminishes at the graduate levels, where students are expected to really understand what the author is talking about. But note well the contrast. One more observation. Up until this point, I have been asserting that religious scholarship differs from secular scholarship in the direction of interpretation, with religious scholarship using a text to understand the world and secular scholarship using the world to understand the text. I’m going to claim now that, in the long run, religious scholarship mirrors secular scholarship, and that it ultimately (if unintentionally) uses the world to understand the text. I’ll draw your attention first to the endless debates concerning the adaptation and interpretation of Halacha in the modern world. There exist (I swear) periodicals devoted to questions like “electricity on Shabbat” and “kosher laws and the modern food system.” Since the first moment that religious commandments became inconvenient (in other words, since the first moment), there has been a pressure exerted on the tradition to adapt. Over time, less religious sects will break away from the orthodoxy (consider the American Jewish Conservative, Reform, and Reconstructionist movements). Those who choose to remain orthodox (following all of the rules, without exception) are forced to “understand” the rules in a way that allows them to function in the modern world. From the outside, it may appear that these groups are living highly restricted lives. And they certainly are. But from inside (the text itself), it’s amazing how much the rules can be “interpreted” to allow people to do whatever they really need to do. After all, the source might have meant something else, if we really need it to. I’ve since left the yeshiva, and after a few days in the secular world my secular mindset had made a complete recovery. I’ve got the religious mindset safely tucked away in my unconscious now, and can bring it back to consciousness with a few minutes of concentration. It’s a great party trick. But do I want to? It’s hard to say. There were some surprising and truly profound benefits to religious thinking. For one, the respect for sources has amazing implications, allowing for far deeper learning than is normally found in secular studies. Another is the suppression of some of the more subtle pitfalls in secular thinking, mostly stemming from our psychological limitations. Religious thinking also enables one to transcend (or ignore, depending on your perspective) the most vexing issues facing humanity. Case in point: the commonly-held notion that human lives have “infinite” value. In the secular world, you must eventually concede that given limited resources, a numerical value must be implicitly placed on human lives (consider budgeting for medical care, or disaster relief). To do otherwise is to create a devastating contradiction. In the religious world, however, no such concession is necessary. The Torah arrives as a divine mediator, instructing mortals in how to navigate the paradox in our world. Resources remain limited, but human life retains infinite value, because the agent driving the distribution of resources was divine in nature. Such ethical alchemy doesn’t seem possible absent this type of philosopher’s stone. On the other hand, religious thought requires you to surrender yourself to an ultimate authority, and to subjugate your personal experiences to that authority (both in the sense of the experiences you are allowed to have, and what you are allowed to learn from them). That is a heavy, heavy price to pay, and for someone like myself (retracing the “naturalist” footsteps of people like E.O. Wilson, Crick and Watson, Daniel Dennett), it is simply too great. I would rather take my chances trusting my own perceptions rather than surrender them entirely. Still, my re-entry into the secular noosphere is a cautious one, and I’m trying to step carefully.